The end of four decades of aluminium smelting in Northumberland has been marked with the power being turned off at Alcan. Rio Tinto Alcan, which owns the plant at Lynemouth, announced plans to close the site in November. At 14:00 BST the power was turned off in a "low key" fashion, marking the end of smelting at the site. Worker Paul Scott said it "puts the final nail in the coffin" for those losing their jobs. John McCabe, the company's regional economic development director, said: "Today is obviously a sad day for all of us concerned, we're bringing 40 years of aluminium smelting to an end at Lynemouth. "Today we turned off the power to the smelter in a very low key, controlled and above all else, safe fashion. "Now we will focus our efforts on mitigating the impact of closure on our colleagues and the community at large." The plant will be decommissioned and cleaned with the aim of bringing new investment and jobs to the site. Leader of Northumberland County Council Jeff Reid, said: "We just need to gather up all of this bad news and try and turn it into something more positive... we have got to try and concentrate on the people who are there at the moment and try and move them onto further good jobs." 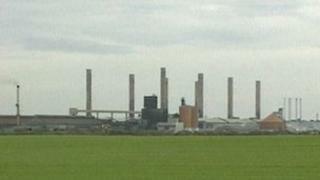 The Lynemouth smelter, which opened in 1972, is estimated to contribute £60m to Northumberland's economy. A total of 515 staff will lose their jobs when it closes, with 323 being made redundant in May. Mr Scott said: "I think it puts the final nail in the coffin, I think everybody will now realise that it is the end." Keeping Alcan Northumberland open "highly unlikely"